As political turmoil and economic chaos roil Venezuela, Mother Superior Emilia Rivero, head of the Roman Catholic congregation that runs a long-term care home for some of the country’s impoverished elderly, says she isn’t afraid to speak to foreign media. The Venezuelan government hasn’t gone after the Church, she says, and the nursing home she administers has never received a penny from the state. “We’re here thanks to the providence of God,” and private charity, she says. Four nuns at the Caracas facility run by the Hermanitas de los Pobres de Maiquetia congregation care for around 40 men, mostly in their late 70s or 80s. The home has always been available to destitute people who have nowhere else to go, the nun says. But things have been changing for the worse, as the economy of the oil-rich country crumbles and people struggle with joblessness and hyperinflation. About three million Venezuelans, mostly young, have had to leave a country where another three million people are over sixty. “Sometimes, their children drop them at the door when they’re leaving,” she said. The centre of activity in the home’s courtyard is a stone dominoes table, where the players have few kind words for President Nicolas Maduro, who is facing an increasingly aggressive challenge from an emboldened opposition. “He’s a thief, a pot head, everything but a president, an absolute donkey,” said one man. “We just want him to step down and leave. Wherever he wants to go, just let him go,” said another. CBC News is not naming the men, some of whom expressed fear that their pensions would be cut off if they criticized the government. Not everyone in the home feels the same way. 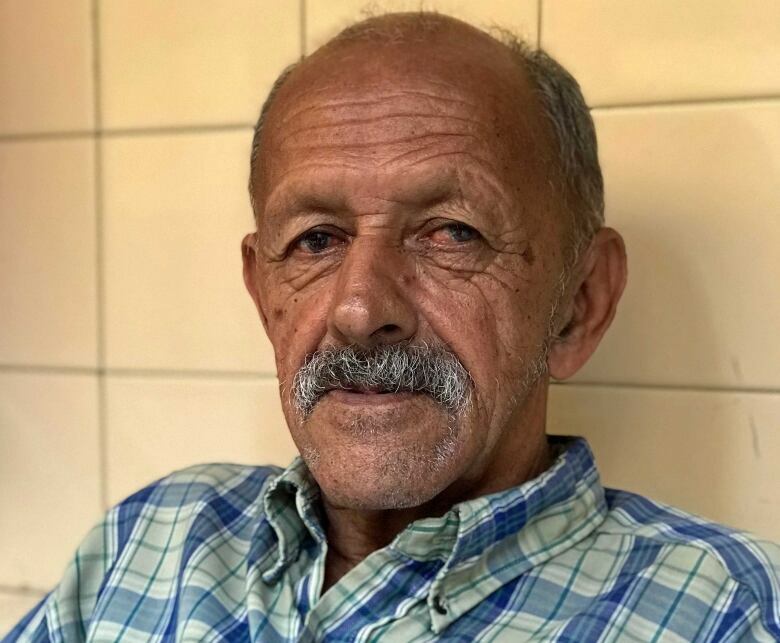 One man who sits off by himself in a wheelchair says he is a supporter of Maduro’s predecessor, Hugo Chavez, and Maduro’s United Socialist Party of Venezuela. But he doesn’t want to talk in more detail, saying he doesn’t trust the media. He says he believes if he speaks, foreign journalists will distort what he says. 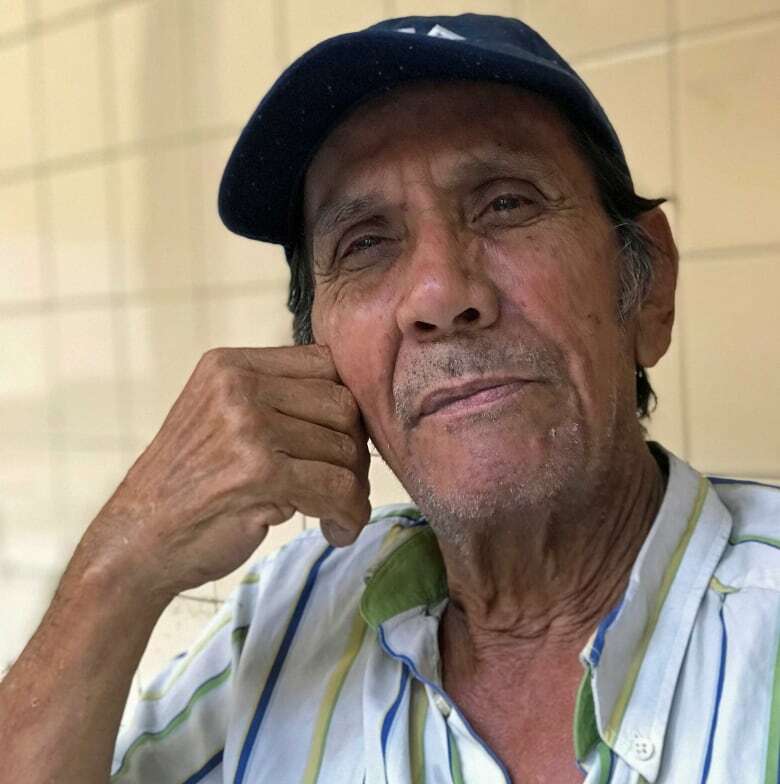 On the back patio, an elderly man sits with a radio on his lap, listening to opposition leader Juan Guaido, who in January declared himself interim president and called for new elections. The nun sees that there are tears on the man’s face. She stands next to him, asks what’s wrong, and wipes his eyes. He buries his face in her apron and begins to weep. The man said his son was shot outside of his own house at age 27, leaving behind two children. The man was too distraught to explain the precise circumstances of his son’s death, and CBC News was unable to verify them independently. The man’s two remaining children have left the country. One went to Ecuador, and the other toward Brazil, though she is still at the border and hasn’t crossed, he said. He says he’s afraid the government will arrest Guaido and that humanitarian aid won’t be allowed to enter the country. The promised aid is meant to help ease critical shortages, which have become a major issue in Venezuela. At the long-term care home, they deal with those issues daily. The water supply is unreliable, food is in short supply and medical needs are hard to meet. Upstairs a man is on his bed with a catheter extending from his waistband. 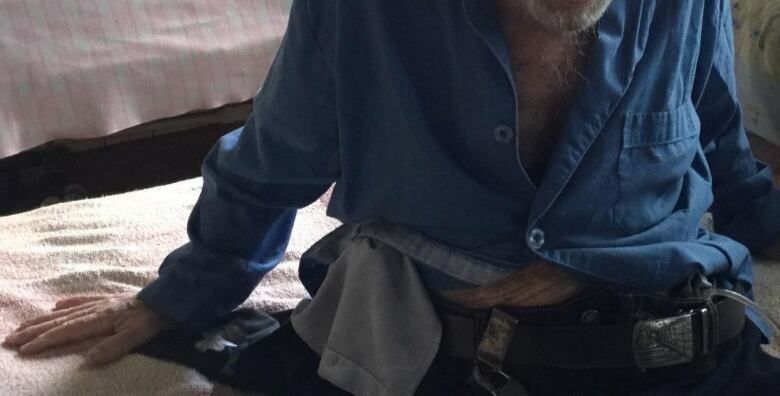 He displays the bag attached to his catheter and explains that he needs medical tests — but the clinic wants payment in dollars and the cost is totally out of reach. A former architect, he’s distraught over what’s become of Venezuela. Half an hour later, the man has a change of heart about what he’s said to our television camera. He raises himself out of his bed and comes down the stairs to the patio. “Don’t show my face. Don’t play my voice,” he said. “Please, I mean it. If you do, they’ll stop my pension. “Nobody who comes here goes away with nothing,” she says with some pride but concedes there’s no way she can admit all the elderly men who need space. Priority goes to those who have serious problems, such as diabetes or amputated limbs. One diabetic man pulls off his sock to display a badly swollen foot with a bandaged toe. Rivero says there’s no hope of getting him insulin. 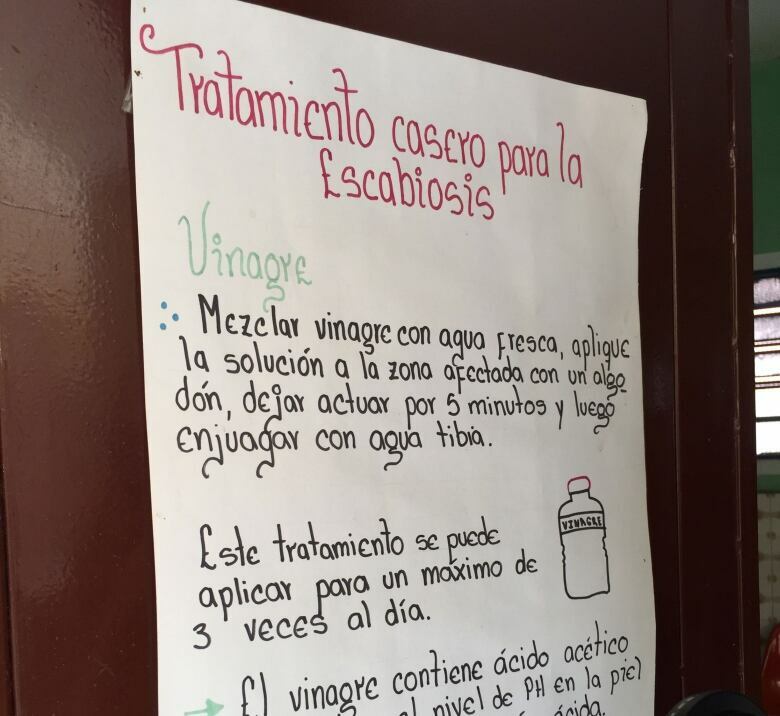 On the wall is a poster showing how to prepare a homemade concoction to treat scabies. The standard treatment can’t be obtained, so the nuns work with a recipe that is based on vinegar. They use the same mix for both skin and bedclothes. It works well, Rivero says, to kill the mites that cause the disease. Faced with growing need — and almost no way to meet it — she doesn’t hold back when asked about the political situation. “Venezuela has been living under a curse. Everything has just been going down, down, down,” she said. “This government has no respect for anything. They have no respect for the grandfathers,” a term she uses for the men in her care. But she says she’s still feeling optimistic.